Bloomfield/East Orange, NJ – Essex County Executive Joseph N. DiVincenzo, Jr. announced plans to build an all access playground, new community center and on-site parking lot in Essex County Watsessing Park on Friday, January 18th. The new all access playground will be the first of its kind in the Essex County Parks System to be designed for children of all physical abilities. The upgrades are part of the County Executive’s ongoing initiative to provide modern facilities to meet the needs of the community. “When we modernize our playgrounds, we have always included some elements that can be used by children with limited physical abilities. But all children should have a place to play, and having an all access playground will bridge the gap between mainstream children and those with handicaps, create a better understanding and foster social relationships,” DiVincenzo said. “This is a significant project because it introduces an attractive recreation amenity, modern community center and much needed parking that makes the park more accessible and easier to enjoy,” he added. Elected officials were supportive of the announced improvements and anticipated their completion. “the community is excited about the playground and the community center. They will be great additions to an area that is seeing a great deal of growth and economic development,” Bloomfield Mayor Michael Venezia said. Joining the Mayor were Council members Nick Joanow, Ted Gamble and Rich Rockwell. “It is a pleasure to partner with you, Joe, on these types of projects. There is no question of your continued commitment to improve the lives of the people we serve,” Freeholder President Brendan Gill said. “Watsessing Park already is heavily utilized, and I know the playground the community center will attract people from all over,” Freeholder Patricia Sebold said. “These additions to Watsessing Park will be a great contribution to Bloomfield and our downtown,” Freeholder Carlos Pomares said. “Thank you to the County Executive for listening to the concerns and needs of the community. This park has really be transformed over the years and these projects resolve a lot of the issues we have raised concerning parking, access and modern facilities,” Bloomfield Councilman and Friends of Watsessing Park member Ted Gamble said. “The all-inclusive playground is symbolic of how Watsessing Park has brought together the communities of East Orange and Bloomfield. It’s fitting that the County’s first all access playground will be here,” Friends of Watsessing Park Vice President Ramon Jiminez said. “Instead of people wanting to or having to leave Essex County to do things, this is where they will want to be. 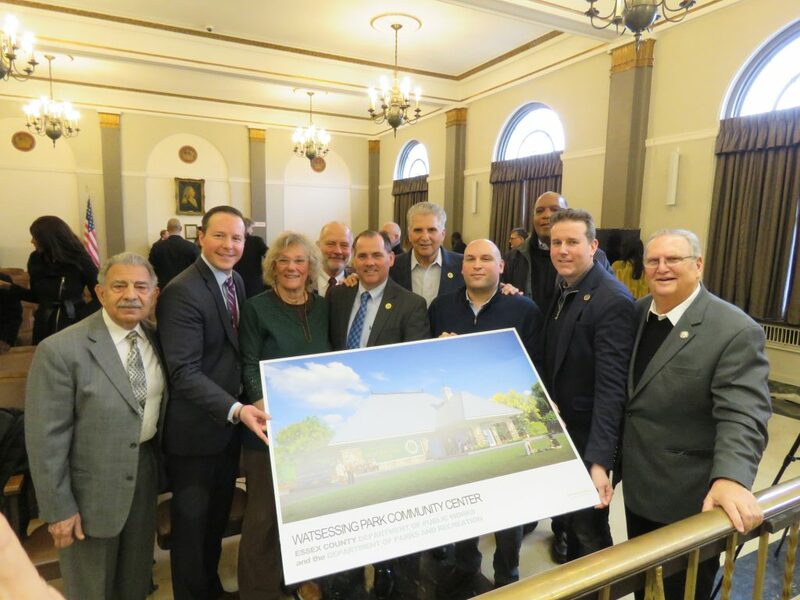 The renaissance in Essex County really started with Joe DiVincenzo and this project is another example of that,” Assemblyman Ralph Caputo said. The all access playground will replace a traditionally designed facility in the park off of Bloomfield Avenue. It will feature a variety of playing apparatus for children of all abilities. Handicapped children will be able to enjoy a playground designed with their needs in mind with new swings, bridges and slides. All equipment will be in compliance with ADA and current playground codes. There will also be a parking lot created on-site to facilitate transportation and access to the playground. The current community center was last renovated in 2008 and has been demolished. It will be replaced with an expanded and more modern building. The structure will have an enlarged room for community meetings, gatherings and events, storage rooms and modern restrooms. The restrooms will be handicap accessible and will be larger in size to accommodate playground users and visitors to the community center. Comito Associates engineers from Newark was awarded a $145,000 contract to design the Watsessing Park community center building. The Shauger Group, Inc. from East Orange was awarded a publicly bid contract for $1,982,580 to perform the construction work. Remington & Vernick Engineers from Secaucus was awarded a $65,000 contract to design the all access playground. A public bid to construct the playground has not been awarded as of this date. The Essex County Department of Public Works will monitor the project and answer questions to avoid delays. Funding is provided from the Essex County Recreation and Open Space Trust Fund and with a grant from NJ Department of Community Affairs. These upgrades are the latest improvements made in Watsessing Park since DiVincenzo took office in 2003. A majority of the projects were funded with grants received by Essex County and the Watsessing Park Conservancy from the New Jersey Green Acres program and the Essex County Recreation and Open Space Trust Fund Advisory Board, and in-kind services from other governmental agencies. In 2017, a 3,000-square-foot water spray park was developed near Dodd Street and the additional climbing apparatus was added to the playground on Glenwood Avenue. In 2016, the sidewalks along Glenfield Avenue, Dodd Street and Cleveland Terrace were modernized, the basketball court and walking track near Dodd Street were resurfaced, and the pedestrian bridge over the Second River, damaged during a spring storm, was repaired. Also, in 2016 the walking track was named in honor of Glen Ridge resident Horace Ashenfelter, the 1952 Olympic Gold Medal winner in the steeplechase who trained in the park. In 2014, ornamental historic lighting was installed along the walking paths throughout the park. In 2010, a synthetic grass surface soccer/lacrosse field in Essex County Watsessing Park off of Bloomfield Avenue was developed, new wrought iron fencing was installed along the perimeter of the park along Bloomfield Avenue and a synthetic grass surface inside the walking track was installed. The walking track, basketball court and lawn bowling building were upgraded, park entranceways were enhanced, and landscaping was improved in the southern section of the park in 2006. In 2005, Essex County opened a 19,500-square-foot Off-Leash Dog Facility, the first of its kind in the Essex County Park System. The same year, the pedestrian bridge in the eastern section of the park was upgraded. In 2004, Essex County rehabilitated the historic bandstand and the Lawn Bowling with a new synthetic grass surface and fencing, and repaired restroom facilities in an adjacent field house. Basketball courts located off of Glenwood Avenue in East Orange were renovated and the Essex County seal was painted at the center of each court. Water fountains were repaired, and additional trash receptacles and decorative benches were placed throughout the park. In 2003, Essex County completed a beautification project at the Bloomfield Avenue entrance to Watsessing Park. New sidewalks, decorative park pathways and landscaping improved the entrance, making it more inviting. In addition, upgrades were made to the drainage system, park trees were trimmed, and the restrooms and senior room were painted. Essex County also installed rubberized safety surfaces in the three playgrounds in the park. The Essex County Park System was created in 1895 and is the first county park system established in the United States. The Park System consists of more than 6,000 acres and has 23 parks, five reservations, an environmental center, a zoo, ice skating rink, roller skating rink, three public golf courses, golf driving range, four off-leash dog facilities, a castle and the Presby Memorial Iris Gardens. At 69.67 acres, Watsessing Park is the fourth largest park in the Essex System. It was designed in 1899 by the Olmstead Brothers firm and land acquisition was started in 1901.